Make one of LUX-camp's luxury camping sites your base for exploring Holland's cities, beaches, and landscapes. Enjoy luxury camping in a bungalow tent, mobile home, or luxury tent, perfect for families, friends, and couples. Contact LUX-camp to learn more about our holiday camping sites in Holland. Why should I camp in Holland? Large parts of Holland have been reclaimed from the sea, and its dikes and canals are an impressive and distinctive feature of the landscape. Modern Holland is a forward looking, green country, with pedestrian and bicycle friendly cities, good public transport, and buildings designed to be ecologically sound as well as attractive and functional. The Dutch are welcoming and outgoing, and most people speak excellent English. Situated near the Belgian border, in the south of the country, Hilvarenbeek is a popular site for family camping holidays thanks to Beekse Bergen, a large amusement park with land and water rides, and safari park where families can get close to leopards, giraffe, and other wildlife. One of Holland’s most famous - and unique - features is the network of canals that runs through cities like Amsterdam and Utrecht, and also into the countryside. Follow the cycle paths along the canals, or take a boat trip, to experience beautiful views and quiet villages, or to see all the sights of a city. In the winter, you can even go ice skating on the canals. 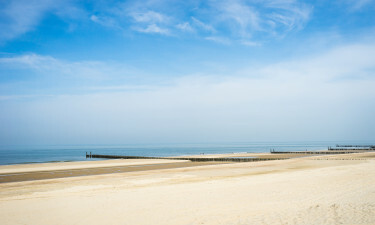 Many of Holland's holiday camping sites are near the sea, because the varied coastal landscape has so much to offer. Create happy memories of sandcastles and ice creams, enjoy romantic walks at sunset, or hang out at beachside bars. While adrenaline junkies take part in sports and activities along the beach or in the sea, wildlife enthusiasts can spot rare plants and birds. There are national parks and nature reserves inland, too. 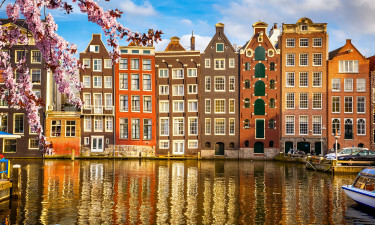 Most tourists aim for Amsterdam, with its canals and museums, but Holland has many other interesting cities, including the university town of Utrecht, historic Maastricht, and vibrant Rotterdam. You'll find theme parks and zoos, and unique exhibits like the Holland in miniature at Madurodam. 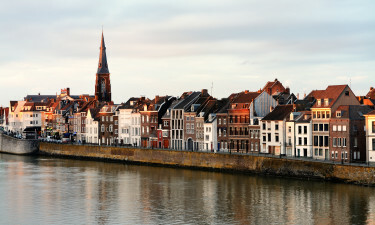 Art lovers can go on the trail of Vermeer, van Gogh, or Mondrian. One of Holland's most famous attractions must be the fields of tulips, at their spectacular best in spring. Dutch food isn't all cheese, although there are more varieties than you may be aware of. Pancakes are served with a wide range of sweet or savoury toppings. Expect to find sausages, stews, soups, and a wide range of snack foods. 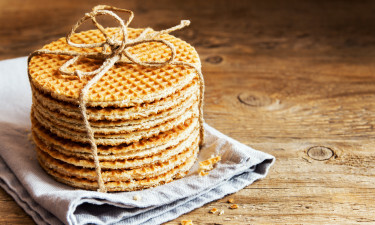 The Dutch love their coffee, often accompanied by a caramel stroopwafel, crisp biscuit, or slice of spiced cake. As well as lager and fruit beer, jenever - a spirit similar to gin - is popular. The climate in Holland is similar to that of the UK. Because the country is so low and flat, temperatures tend to be fairly consistent all over Holland, although it may be slightly cooler on the coast. 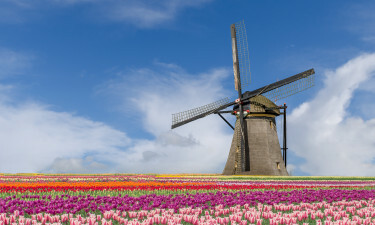 Remember the long association of Holland with windmills, and, in modern times, wind farms, suggests that you might encounter a few windy days, and come prepared for rain showers too. The historic Dutch empire was one of the leading powers in the world, with a strong navy, and its Dutch East India Company dominating world trade. Dutch exports included Delft china, flowers and bulbs, while the company had a monopoly on imports and trade with Japan. Holland was the home of artists, writers, scientists, and philosophers. Today, the country is technologically advanced, with a high standard of living.